Have you ever wondered how beer would taste if drunk from a small animal carcass? 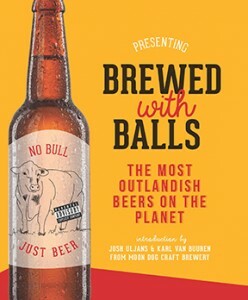 Ever wanted to add goats’ brains, beard hair, bulls’ testicles, hemp or pizza to your brew? Well, it turns out someone already has – and the results are surprisingly delightful. Brewed with Balls features 65 of the weirdest, wildest and most wonderful beers on the planet, created with ingredients and brewing techniques that push the boundaries in all directions. From squid ink to collagen to whole cherry pies, there’s nothing these brewers won’t use to make a beer. So the question for all beer lovers is: where would you draw the line?